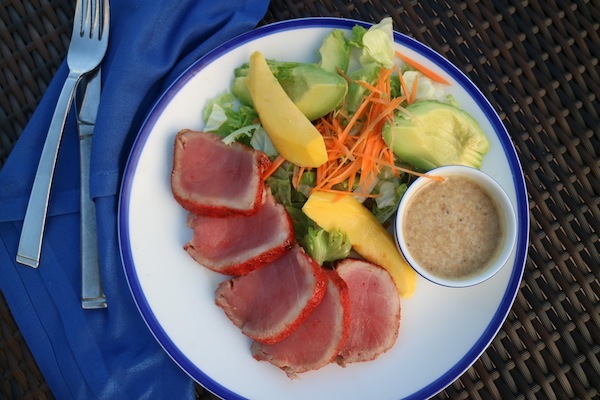 A quick sear of good-quality tuna steak and a coating of honey and chili powder results in ahi with mild, “blackened” flavors that mimics the tasty poolside dish we enjoyed at Cancun's Marriott Cancun Resort. (They coat their tuna with a vibrant-colored chili candy powder called Miguelito chamoy powder.) Add a lettuce, avocado, mango, and tangy-sweet ginger dressing, and you’ve got one heck of a fast and fancy lunch or dinner! BTW, you can use gluten-free store-bought oriental dressing, if desired. Combine all the dressing ingredients in a bowl and whisk to combine. Set aside. Make the tuna: Place a skillet over medium-high heat, add 1 tablespoon olive oil, and heat until hot but not smoking. Generously season the tuna with salt and pepper, then sear the tuna in the oil for 1 minute per side. Remove from the heat and let cool. Place the remaining 1 tablespoon honey on one small, rimmed plate and the chili powder in another. Gently dip the tuna pieces with the honey, then dredge them in the chili powder. Season generously with salt, slice each tuna into strips using a very sharp knife. Divide the tuna among 2 dinner plates. Divide the lettuce between the two plates, arranging it next to the tuna. Top with the avocado, mango, and shredded carrot and serve with the dressing.